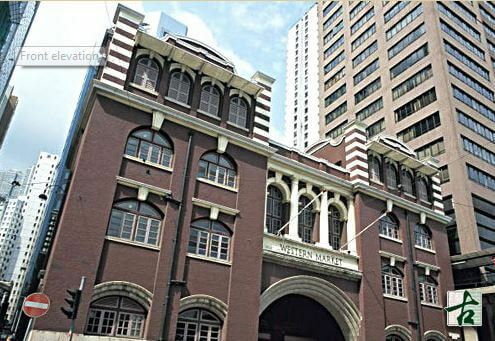 HF: The building that is now known as Western Market was originally the old Western Market (North Block), which was identified by Antiquities and Monuments Office (AMO) as one of the Declared Monuments in 1990. 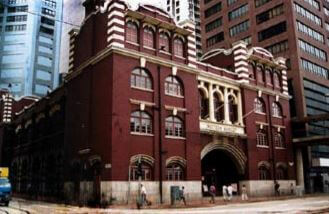 It is the oldest market building surviving in Hong Kong. Further information about the demolished South Block would be of great interest. As would images of both blocks under construction. “Although markets may not be as historically inspiring as other buildings, they are very important to the daily lives of the population and very much part of the fabric of Hong Kong. The Western Market on Hong Kong Island has for many years been an essential part of people’s lives. It originally consisted of two separate blocks – the South and North Blocks. They were constructed in the same style but at different times and on different sites. The South Block was built in 1858 and demolished in 1980 and little is known of its history. The remaining North Block, smaller and more compact than the South, but modelled upon it, was completed in 1906. 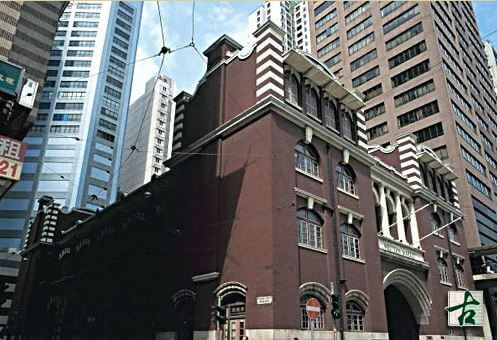 It is located between Des Voeux Road and Connaught Road. It has walls of red brick on a granite base; a large and handsome granite arch over its main entrance, and four corner towers highlighted in “bandaged” brickwork. The floors are of concrete and the roof is supported by cast iron columns. It stands prominently among the surrounding high-rise modern structures as a small building of fine quality and style. The client for the building was the Public Works Department. It has closed as a market recently [ie c1990] but has been preserved under the Antiquities and Monuments Ordinance (1976) as a building of historic value and it is intended that it is adapted for other uses. 1902 A contract for the construction of the foundations was entered into and, up to the end of the year, 214 piles out of a total of 367 had been driven. The length of the piles ranged from 15 to 45 feet, The excavation of the foundations, all of which had to be timbered, was practically completed. Much water was met with in some parts of the foundations and a portion of the old Praya wall had to be taken down. 1903 The foundations were nearly completed up to ground level. They consist of hardwood piles of an average length of 29′ 10″, numbering in all 367, with longitudinal and cross bearers on top. Around and above the bearers is cement concrete. All the trenches for foundations, being in made ground, had to be closely timbered and much trouble was experienced with water which came in very freely, particularly at the South West corner of the site. A portion of the old Praya wall had to be taken up in connection with the work. 1904 The contract for the foundations was completed in March and a contract for the superstructure was entered into with Messrs. Sang Lee & Co. in November. The delay in arranging the latter arose through the large number of important works for which drawings, specifications and quantities had to be prepared and the general amount of trouble experienced in connection with the Law Courts. Work on the building was begun at the close of the year. 1905 Fair progress was made with this work during the year, the walls to the North and South blocks being built 12 feet 3 inches, and the walls to the Market 12 feet above ground floor level respectively. The main arches to principal entrances on North and South fronts were practically completed at the close of the year. The cast iron columns and steel work to floors were delivered on the site during the month of December. 1906 This building was completed and handed over to the Sanitary Board in July. It consists of two main floors for market purposes, accommodation being provided for the Inspector and coolies by the construction of mezzanine floors at the North and South ends. The ground floor contains 12 large poultry shops, a poultry killing room, a large store, engine room, Inspector’s office, and latrines, and the first floor 14 shops and 67 stalls for the sale of fish and two apartments for the storage of live fish. There are four wide granite staircases giving access to the first floor and ample entrances are provided, near which there are money changers’ stalls. The engine room contains an oil engine and pump for pumping water from a well into two large tanks, with a capacity of 21,000 gallons, on the roof of the building, whence it is drawn for cleansing purposes. The lighting of the Market is Kitson lights, 6 lamps of 500 candle-power being provided on each floor. The quarters and some of the subsidiary parts of the building are lighted by gas. The walls are of Canton red brick faced externally with Amoy bricks and having a deep plinth and dressings of granite. They are finished internally with a dado of white glazed tiles ranging from 4 feet to 5 feet in height, above the level of which they are pointed with mine mortar and whitewashed. The floors are of cement concrete, supported where necessary on cast iron columns and steel beams and the roof is covered with double pan and roll tiling on steel trusses and purlins. The total cost, including piled foundations, fittings, lighting, water supply etc., was $172,567.46. Progress appears to have been satisfactory under the contract with Sang Lee & Co. who immediately after completing this building, commenced the Post Office (on the reclamation) and also worked on Government House. This article was first posted on 9th May 2017. 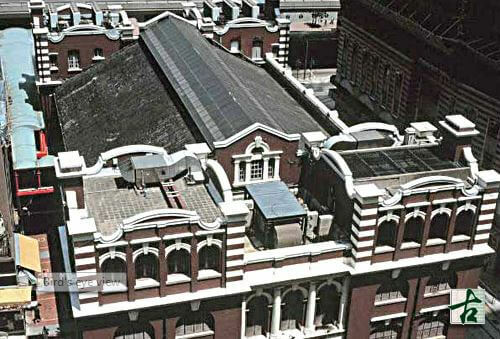 There were two generations of the Southern Block of the Western market. The first was demolished in 1911 with a new building replacing it opening in 1913.